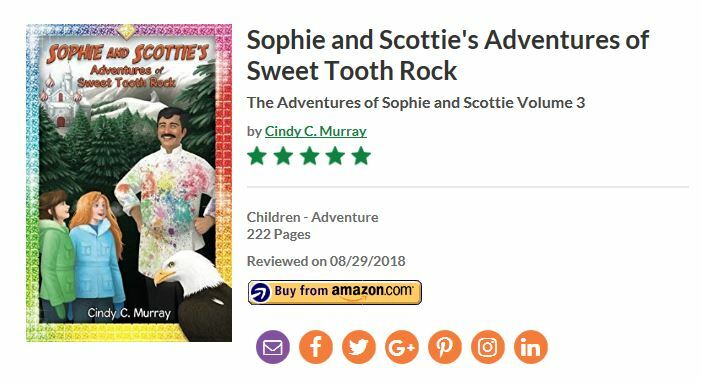 Sophie and Scottie’s Adventures of Sweet Tooth Rock has received 5 Stars form internationally known Reader’s Favorite! This is a fun book and is perfect for ages 7 to 12, being the third book in The Adventures of Sophie and Scottie chapter book series. It’s full of action, adventure, a touch of science and a bit of magic! Don’t miss joining the girls as they use their trusty map to navigate this sweet adventure while working with renowned candy maker Samuel McSweet and then encountering a giant grizzly bear named Grizz and a super fast bald eagle named Suka.